Many people in the world use hair dyes. It is estimated that more than one-third of women over age 18 and about 10% of men over age 40 use some type of hair dye. Over 5000 different chemicals are used in hair dye products, some of which are reported to be carcinogenic (cancer-causing) in animals., Because so many people use hair dyes, scientists have tried to determine whether exposure to the chemicals in hair coloring products is associated with an increased risk of cancer in people. Early hair dye formulations contained chemicals, including aromatic amines that were found to cause cancer in animals. In the mid-to-late 1970s, however, manufacturers changed the components in dye products to eliminate some of these chemicals.,, It is not known whether some of the chemicals still used in hair dyes can cause cancer. Given the widespread use of hair dye products, even a small increase in risk may have a considerable public health impact. Different results emerge instead from studies on the influence of exposure to hair dyes, on the part of employees to hairstyles. Over the years, some epidemiologic (population) studies have found an increased risk of bladder cancer in hairdressers and barbers., A 2008 report of the IARC concluded that some of the chemicals these workers are exposed to occupationally are probably carcinogenic to humans. Hairdressing work is classified as probable carcinogenic, based on an excess risk for bladder cancer. However, it is highly controversial if current work still entails exposure to carcinogens, or if this has been eliminated by restricting the use of several aromatic amines in hair dyes. The large individual variation in the products used, biological half-lives have challenged the classic occupational hygiene assessment of hairdressers' exposure to aromatic amines and with several other intermediates that serve due to hair coloring. The current evidence provides limited evidence on the association between personal hair dye use and human cancer risk, except for the possibility of hematopoietic cancers and to a lesser extent bladder cancer. Several methodological issues should also be considered in future studies, including completed hair dye use information such as on the timing, duration, frequency, and type of hair dye product use. As previously stated, in this context is very difficult the assessment of mutagenic and/or carcinogenic damage due to exposure to hair dye, especially with routine blood tests. The aim of this work is to study oxidative stress possibly induced by exposure of hairdressers to hair dye, monitoring the formation of malondialdehyde. This assessment will take account of two parameters that we consider very important and that is smoking and age, which in this particular season of work generally coincides with the time of exposure, through the analysis of malondialdehyde. The aim of this research is to study and determinate a prognostic index, by monitoring the oxidative stress, produced, to the exposure to the hair dyes, in the hairdressers, and in consumers measuring the concentration of salivary malondialdehyde. Saliva samples were collected from groups of volunteers, all women, 27 for hairdressers, 27 for the control group, and 21 in the consumers of hair dyes, at last 10 years, with a media with an average of the same dyes, of three times a year. Hairdressers are all women: Fourteen working in shopping center (CC), with shops and large size with very efficient systems of ventilation, while the other 13 work in small privately owned shops (NP). All the hairdressers carry out this activity, at least for 5 years, excluding those spent in training school. The samples are collected in the morning and after 2 h of taking food. In the previously cooled samples, the concentration of MDA was determined by the analytical method of thiobarbituric acid test. From the study excluded people with a history of diseases that can be a source of generation of excess free radicals, such as smoking, diabetes, and cardiovascular disease. We excluded those who have anamnesis reported using alcohol in a nonmoderate, those taking antioxidants, such as vitamins or supplements containing curcumin and quercetin polyphenols, and finally even those people who perform strenuous anaerobic exercise. The results are statistically analyzed by Kruskal–Wallis and Mann–Whitney test; the first comparison of the oxidative stress, induced by hair dyes, executed in hairdressers and a control group, while in a second time, the salivary MDA values are analyzed by the same control group and consumers of hair dyes, at least for 10 years. The data relatives of the monitoring of salivary MDA are expressed in [Table 2]. 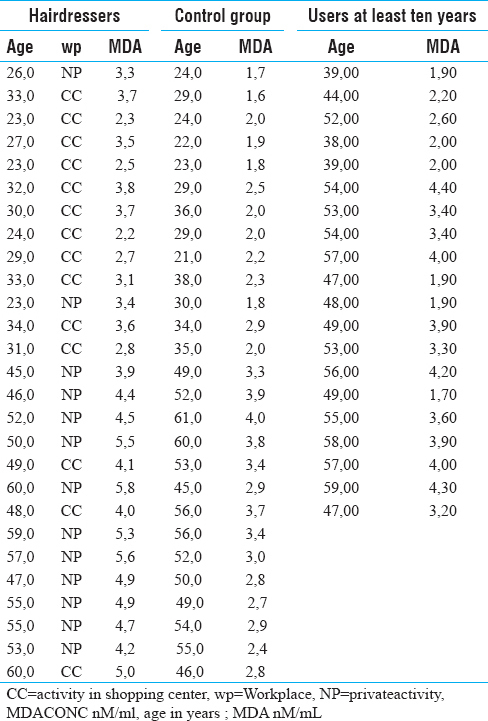 Median values distribution is not normal, so medians are used instead of media and related interquartile intervals, see [Table 1]; while in [Table 2] are showed the salivary MDA values, in all groups. Comparing the three groups with tests for K-independent Kruskal–Wallis samples (dyed vs. control vs. dyed for at least 10 years), there is a significant difference for the amount of MDA; P < 0.001. NP versus 10 years, P < 0.001. Because many studies indicated the difficulty on assessing the possible carcinogenic effects of hair dyes, for their high time of the latence, it is necessary to succeed to identify a marker of their possible carcinogenic activity, which we hypothesized in this study could be MDA. Before analyzing the data obtained by monitoring of salivary MDA, you should check if the hypothesis forms the basis of this study, which is a possible correlation between the lipid peroxidation and hair dyes; you will find a correlation not only theoretical but also practical with work featured in literature. In a recent work has been measured telomere length in peripheral blood leukocytes. Telomeres are DNA–protein structures located at the ends of eukaryotic chromosomes composed of hundred grand of tandem repeats TTAGGG. The main function of telomeres is maintaining the integrity of chromosomes, preventing their erosion and the phenomenon known as end fusion and thus adjusting cell lifespan. The hairdressers had shorter telomeres than non-hairdressers. Some factors are known to accelerate the erosion of telomeres, including oxidative stress, and then this study stands in line with other experiments and aims to verify whether oxidative stress is induced by hair dyes. The hair dyeing process can be divided into three phases: in the first, intermediate dye (the p-phenylediamine and p-aminophenol) attaches to the hair and then reacts with a compound called coupler (1-naphthols, m-diamines, resorcinol, m-amino-phenol, pyrazolones), to form the azocompound or chromophore system. Now, as p-phenylenediamine and aminophenyl have been suggested as possible carcinogens or mutagens in experimental studies,, there is the theoretical possibility that the two compounds can exert their toxicity, both on hairdressers and on consumers. The possibilities, which these chemical compounds can carry out during their carcinogenic activity, are essentially two: the first for direct skin absorption and the second, which is the most important, is related to the inhalation of vapors. This last situation clearly involves more directly the hairdressers. From the data obtained, in this research, it is clear how this is actually true. A higher concentration of MDA in hairdressers is statistically relevant in this group, with respect to both control and consumers. These data, so, became the most important aspect, showed by our study, because as within the group of hairdressers, there is a greater concentration, statistically significant of MDA, in the workers of private shops, with respect to the workers employed in the shopping centers. This fact can be explained by admitting that these hairdressers generally work, in premises much more small and not equipped with efficient ventilation systems, such as those found in shopping centers. Of particular interest is that the salivary MDA concentration showed in the hairdressers may also vary according to age regardless of the beginning of their working activity. In 27 hairdressers, 20 (54%) are under 40 years of age, and in the absence of particular pathologies that alone can justify an increased oxidative stress, the other risk factors considered as the age. Oxidative stress probably related to the mitochondrial dysfunction. Mitochondrial free radical theory of aging postulates that somatic mitochondrial DNA mutation that accumulates on life causes the production of cells and tissues. In fact, studies show that the oxidative capacity maximum increases with age, while increases reactive oxygen species production. The current evidence provides limited evidence on the association between personal hair dye use and human cancer risk, except for the possibility of hematopoietic cancers and to a lesser extent bladder cancer. Several methodological issues should also be considered in future studies, including completed hair dye use information such as on the timing, duration, frequency, and type of hair dye product use. The monitoring of salivary MDA in hairdressers and in the control group is a method valid for the conditions for taking the samples, less subject to alteration phenomena of compounds in the steps of analyzing the results of this study; it can be said that exposure to hair dye causes a significant increase of oxidative stress in the hairdressers. This factor involves a complex of metabolic disorders that produce free radicals, which are added to those arising from the typical processes of aging. These data show a potential carcinogenic risk, we think possible in many anatomical sites, well-known, vascular damage, and produced by an excess of free radicals. Johansson GM, Jönsson BA, Axmon A, Lindh CH, Lind ML, Gustavsson M, et al. Exposure of hairdressers to ortho- and meta-toluidine in hair dyes. Occup Environ Med 2015;72:57-63. Harling M, Schablon A, Schedlbauer G, Dulon M, Nienhaus A. Bladder cancer among hairdressers: A meta-analysis. Occup Environ Med 2010;67:351-8. Bjarte Dk. Tobacco Control 2005;14:305-32. Zaga V, Gattavecchia E. Free radicals and cigarette smoke. Gior It Mal Tor 2002;56:375-91. Li H, Åkerman G, Lidén C, Alhamdow A, Wojdacz TK, Broberg K, et al. Alterations of telomere length and DNA methylation in hairdressers: A cross-sectional study. Environ Mol Mutagen 2016;57:159-67. Menicagli R, Duca M, Rancoita PM. Malondialdehyde salivary concentration monitoring (MDA) in smokers using dipsticks. Acta Biomed 2016;87:6-15. Blasco MA. Telomere length, stem cells and aging. Nat Chem Biol 2007;3:640-9.
von Zglinicki T. Oxidative stress shortens telomeres. Trends Biochem Sci 2002;27:339-44.